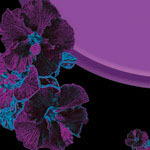 This computerized alteration of a classic Hawaiin flower, gives a cosmic feel to a vibrant, bold design. Be the talk of the town with this futuristic hawaiin flower design on your device. Available in several color combinations.